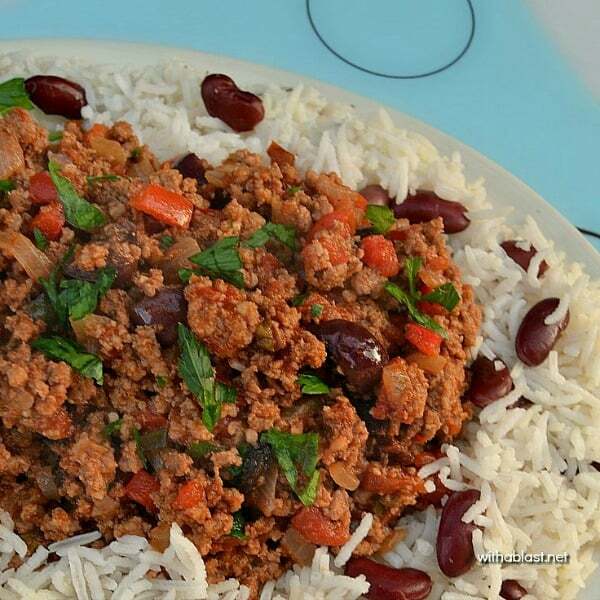 Cuban Picadillo served with a side of Rice and Beans is a quick ground beef, spicy dinner – only 30 minutes from prepping to serving ! 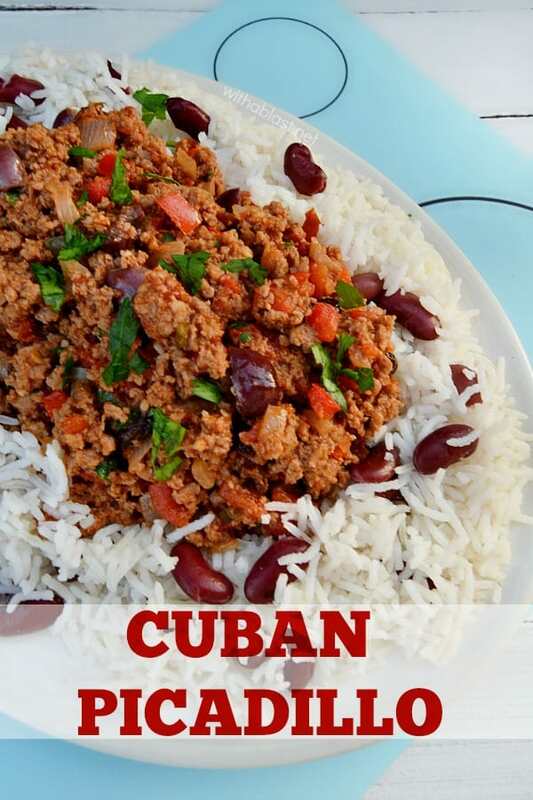 Whilst browsing some of my old IDEAS magazines, I came across this recipe for Cuban Picadillo which I then adapted a little. 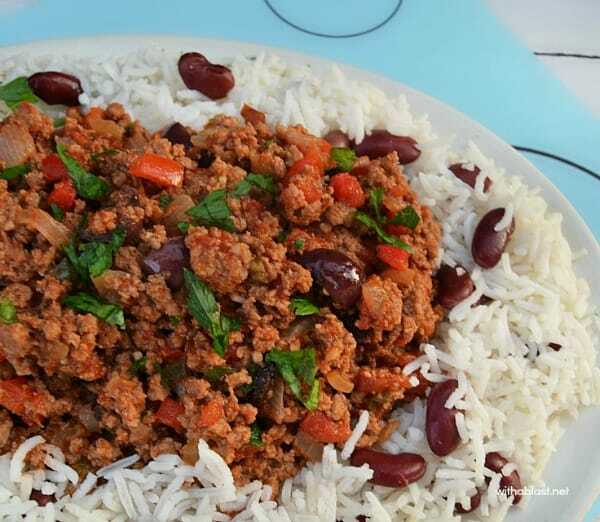 I have never heard of it, but the ingredients intrigued me… and the rice with beans is actually part of the dish! Of course I googled this and there were quite a lot of different recipes. Mostly served with rice and beans as I did. But there were also suggestions that it can be served as a filling, which by the way, my daughter mentioned as soon as she tasted this. It is a delicious, tasty and spicy meal. And it took only about 30 minutes – start to finish. I added 2 chilies but you can add more, or less, whichever degree of spiciness you prefer. 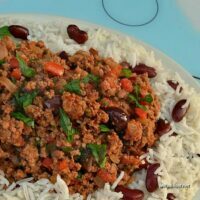 Cuban Picadillo served with a side of Rice and Beans is a quick ground beef, spicy dinner - only 30 minutes from prepping to serving ! I grew up in Florida … and Cuban cuisine is very prominent in parts of the state. I love Cuban food! I had to google fresh Rocket – For any Americans, we call rocket "arugula". I shared on my FB page and pinning it now! I lived in Miami for a few years and loved Cuban food, except for plantains! This sounds really good. I would love it if you would drop by my blog on Friday and link it up to our party! I love Cuban food. We'll have to try this recipe. YUM! I've never tried Cuban food, but this looks good! Thanks for sharing at The Fun In Functional! I bet this has great flavor. Thanks for sharing on Tout It Tuesday! Hope to see you next week. Hi! I am your newest follower and was hoping that you would stop by and follow me back!! I can't wait to try this recipe, Linda. We will really enjoy this flavor combination. Have a fabulous weekend and thank you so much for sharing with Full Plate Thursday. Hello! Thank you for participating at SHOW-licious Craft Showcase! 🙂 I host it every weekend so I hope you return to post more of your great things! I love cuban anything! This looks delicious! thanks for sharing this up at Katies Language Cafe's weekly recipe link up! Looks delicious! I've pinned this as well – thanks for sharing at MightyCrafty Mondays.